Are you looking for an original gift idea for someone who loves our traditional sauces? 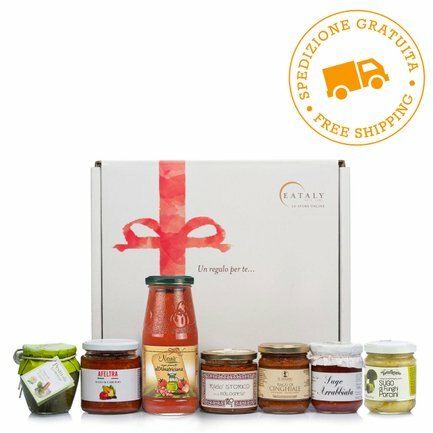 Buy this gift pack, with free shipping, which contains a selection of our typical sauces. This gift idea is perfect for those who don't have much time to cook, but don’t want to give up the pleasure of an amazing pasta. The sauces contained in this gift idea are: Arrabbiata Sauce from Riolfi, cooked with fresh and carefully selected products; Genovese Pesto, just like the ligurian tradition asks: Italpesto only uses the best ingredients from the area. Amatriciana Sauce from Nanù, devoted to the selection of raw materials. The historical Bolognese Ragù, from La Dispensa di Amerigo, made with high quality beef, containing more vegetables and less tomato. The Boar Meat Ragù from Il Vallino, with its intense and unmistakable taste, for bringing the taste of Tuscan tradition to the table. Arrabbiata Sauce 180g:Italian tomato 70%, onions, chilli pepper 10%, extra virgin olive oil, carrots, salt, sugar, garlic. ALLERGENS: does not contain allergens. Historical Bolognese Ragù 200g:beef 36 g, tomato passata, pork pancetta 17 g, extra virgin olive oil, Medicina golden onion, carrots, celery, double tomato concentrate, Cervia sea salt. Porcini Mushroom Sauce 190g:Porcini mushrooms (Boletus edulis and related group) 43%, water, cream, extra virgin olive oil, Roero Arneis DOCG wine, butter, corn starch, salt, garlic, pepper. Allergens: contains milk. 87729:84% tomato pulp, 5% bacon, 5% pig cheek, pork meat, 1.7% onion, chili pepper (0.6%), olive oil, salt, pepper. acidity regulator: citric acid. 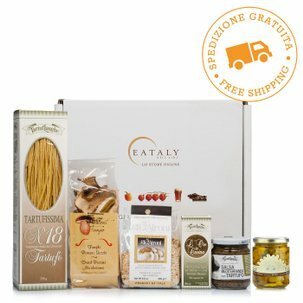 This box contains: Sugo all'Arrabbiata 180g - Riolfi; Pesto alla Genovese 180g - Italpesto; Sugo all'amatriciana - Nanù; Ragù storico Bolognese 200g - La Dispensa di Amerigo; Ragù di Cinghiale 180g - Il Vallino; Sugo ai Funghi Porcini 190g - Tartuflanghe; Sugo Carciofi 270g - Afeltra.